Note: This is the third post in a 4-part series. Read part one, part two and part four. USAID has supported Egypt’s water sector – including its water and wastewater utilities – for more than three decades. Much of Egypt’s water and wastewater infrastructure built since the early 1980s – including treatment plants and water distribution networks – has been developed with U.S. assistance. Before USAID’s involvement, water and sanitation services were unevenly provided by a mix of municipal services providers and regional authorities. In 1975, for example, 70 percent of Egyptians had access to piped water; today, nearly 100 percent do. Accurate and consistent data were rare. Data aggregated nationally were difficult to verify. As elsewhere in the region, U.S. assistance strives to make available accurate data and decision-support systems to improve water-related decision-making. The latest generation of USAID assistance works to ensure the sustainable stewardship of Egypt’s water infrastructure by emphasizing the management systems required to make the most of past infrastructure investments. With USAID assistance, major infrastructure investment and regulatory reform projects were launched, and the local water and wastewater departments were restructured and consolidated as operating subsidiaries of a national holding company. A key element in USAID’s approach is creating the systems to track and monitor data, and indicators to monitor service quality, the efficiency of water applications, and the cost-effectiveness of capital investments. 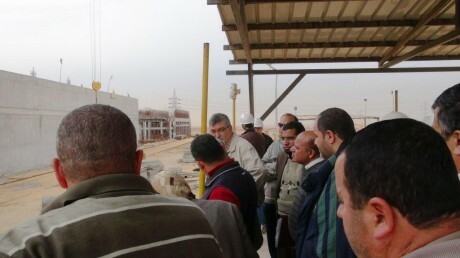 In Egypt, five national agencies are involved with construction and maintenance of water supply infrastructure. Until recently, there were no systems in place to track the thousands of construction projects underway nationwide at any given time. This inability to track and monitor construction progress led to poorly informed investment decisions and inadequate cost control. In 2006, the newly-installed minister overseeing these efforts requested U.S. assistance to establish a capital investment project tracking tool. Today, this system provides real-time summaries of over 3,000 construction projects underway, helping to prioritize investment decisions, quantify the expected impact, and justify and explain investment decisions. Today, a range of USAID systems and tools are being used by sector officials, making use of American technical expertise to improve local water management. Using these and other management tools, USAID is helping monitor performance, prioritize and track investments, and effectively make the case for water and wastewater investments.